Lisa Su unveils the RX 400 series, a VR backpack and a Zen teaser. 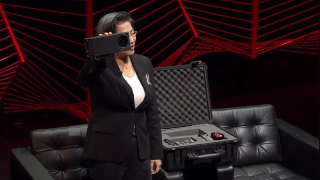 AMD CEO Lisa Su took the stage at the PC Gaming Show to talk about Team Red's latest and greatest hardware. Up first was a showcase of their new Polaris GPUs. Polaris has been in the making for a long time, and as we’ve covered already, AMD is going after the $100-$300 market. AMD kicked off with a demonstration of Doom running on Polaris, using the Vulkan API. They didn’t specifically name the graphics card, but presumably this is a lower end Polaris 11 GPU, something like the RX 460, and frame rates were hovering in the 60-90 fps range. This is a chip that AMD plans to use in gaming notebooks and laptops, so hitting 60+ fps at 1080p is a good place to start. A look at the Radeon RX 480. AMD did have the "final" hardware on display for their Polaris cards, the Radeon RX 480, RX 470, and the RX 460. Starting with the RX 480, this is the card we know the most about. It’s a 150W TDP card, targeting “premium VR” with prices of “$199 and above.” This will be a disruptive card in the sense that it brings the barrier to entry for VR down from nearly $300 to $200 (though you still need a $600+ VR kit). Lisa Su holds up AMD's RX 470 (left) and RX 460 (right) cards. Moving down the list, the RX 470 is focused on “excellent performance per watt,” implying that perhaps taking a cue from the R9 Nano, AMD has been able to drop power requirements quite a bit without reducing performance too much. It will be “2.8X over the previous generation;” assuming that’s the R7 370, that would be a massive jump in performance at the $125-$150 price point. Su noted that there will be many different RX 470 cards from their AIB (add-in board) partners like Sapphire and Asus. Finally, the 460 will focus on the esports market. It uses less than 75W and runs cool and fast, which will be great for less demanding games like League of Legends. A closeup of the Radeon RX 460. AMD had a few other hardware pieces to show off. There was an Alienware reference design VR backpack with an RX 480 and all the required PC hardware inside, hooked up to an HTC Vive. This frees you from the wires that normally create problems in VR, giving the ‘full VR experience.’ So if you’ve ever wanted to play some VR games in your backyard or a parking lot, your dreams may be realized in the near future. We’ll be curious to see how long the batteries last, among other things, and the option to do more with alternate reality is definitely there. Alienware's VR backpack sports an AMD RX 480 GPU. AMD also partnered with Croteam, developers of the Serious Sam games, to show off Serious Sam VR: The Last Hope. “We have two eyes; shouldn’t we have two graphics cards?” No, this wasn’t demonstrated on the Alienware VR backpack. Finally, AMD has been doing quite a bit of development on CPUs, and they’re talking about Zen. Zen will going first into enthusiast class desktops processors, using AMD’s Summit Ridge platform, aka AM4. This is good news, as it means AMD is reentering the performance CPU market. Zen will be coming later this year or early in 2017, but AMD had little else to say other than that they’re doing validation and they have Zen running Doom. AMD didn’t show any specific performance numbers or discuss features, though AMD has previously revealed that Summit Ridge will have models with eight CPU cores with 16 threads. In AMD's Zen teaser video, the company showed a tray of CPUs that didn't have any model numbers printed on them. For gaming, it may not matter too much, as we’ve looked at performance with a variety of CPUs and the main bottleneck in most games remains the graphics card. However, the combination of low-level APIs with better multi-threading support and processors with more than four cores does hold some potential to do more, and there are non-gaming uses where faster processors are extremely helpful (e.g., video encoding). We’re definitely interested in seeing what Zen brings to the table when it launches. AMD ended its video with a CPU with the words "I AM ZEN" on its face.